Oh Dear! 'Dodgy Depictions' Of Prince William And Kate On Official Coin : The Two-Way The reviews are in about the official commemorative coin for the engagement of Britain's Prince William and Kate Middleton — and they're not kind. Kate looks "far chunkier" than in real life. The prince looks like Elvis. 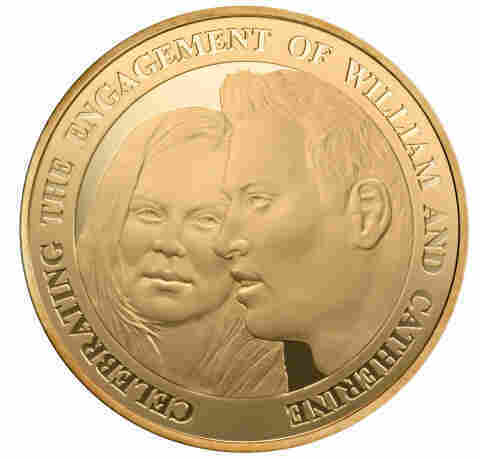 The news outlets say the coins were approved by the Queen and William. There's no word we can find about what Kate has to say. By the way, if you'd like one of the coins, the Royal Mint is taking orders here. Prices start at 9.99 pounds (about $15.40) and go all the way up to 1,550 pounds (about $2,400) for the gold proof version.